Freshman Jack Eichel and 2015 recruit Jordan Greenway will play in the third annual USA Hockey All-American Prospects Game at the First Niagara Center in Buffalo on September 25. The pair are among the 42 American players, eligible for the 2015 NHL draft, invited to participate. 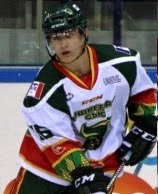 2015 recruit Bobo Carpenter scored his fourth point of the Junior Club World Cup tournament, an assist as Sioux City dropped a 4-3 decision to JHC Spartak. The Musketeers will face host Toplar (Ufa, Russia) in the semifinals on Friday. Thanks to the blog reader who alerted us to this YouTube compilation of all of former BU standout Nick Bonino’s goals from the 2013-14 regular season and playoffs. Two key cogs in the Terriers 2009 national championship team, Chris Higgins and Colby Cohen, have been reunited as teammates on the Nottingham Panthers in Europe’s Champions Hockey League. Higgins, who helped the Belfast Giants win the Elite League championship last season (19-41-60 in 51 games), signed with the Panthers earlier this summer. Cohen, who was limited by injury to a handful of games last season, joined the Panthers a few weeks ago. Former Terrier defenseman Amanda Shaw, who earned Hockey East All-Rookie honors in 2005-06 before playing for Team Canada, is part of a pioneering group of Canadian women who have become professional firefighters. Shaw is serving as a firefighter in Hamilton, Ontario. 2015 recruit Bobo Carpenter scored his third goal of the Junior Club World Cup tournament in Ufa, Russia, as the Sioux City Musketeers defeated HC Riga, 6-1. Carpenter scored his team’s fifth goal on a breakaway. The USHL entry in the tournament has a 3-0 record and has already earned a spot in the semifinals on Friday. The Musketeers play their final first-round opponent, JHC Spartak,Wednesday. 2015 recruit Jordan Greenway (photo) and younger brother James, who will skate this season for the NTDP U-18 and U-17 squads respectively, were interviewed by their hometown paper, the Watertown, NY, Daily Times, about leaving their home in Potsdam to play first at Shattuck St. Mary’s and now with the NTDP. Playing for the U-17's, James will be a teammate of 2016 recruit Clayton Keller, who also played previously for Shattuck. The two NTDP squads begin practice today in Ann Arbor. 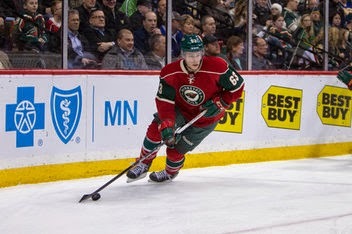 Former Terrier Charlie Coyle, coming off a strong post-season for the Wild, talked with New England Hockey Journal about his path from Thayer Academy to BU and the NHL. Former BU assistant coach Buddy Powers continues his hockey career as a scout in the Dallas Stars organization. Powers, who played three seasons at BU, including Jack Parker's first full season at the helm, later was head coach at Rensselaer and Bowling Green, before returning to BU as an assistant to Parker and to current head coach David Quinn last season. Dallas Stars hire Buddy Powers to scout Minnesota area, strong hire by Jim Nill. NBC Sports reports that freshman center Jack Eichel will participate in the 2014 CCM/USA Hockey All-American Prospects Game in Buffalo’s First Niagara Center on September 25. Full rosters for the event, now in its third season, will be announced next week. Junior Matt Lane played in the inaugural Prospects Game in 2012. 2015 recruit Bobo Carpenter (Sioux City photo) scored a pair of goals to lead Sioux City past Red Bull of Salzberg, 7-2, in their first preliminary round game at the Junior Club World Cup in Ufa, Russia. The 5-11, right-shot forward from Reading, Massachusetts tied the game at one apiece in the first period on an unassisted goal and gave the Musketeers a 4-2 lead in the middle period with a power play marker. . Earlier, in an exhibition game against Vityaz Chekhov, Carpenter’s extra-attacker goal knotted the game at 3-3 in the waning seconds of the third-period, but the Musketeers lost, 4-3 in a shootout. 2016 recruit Hank Crone scored a hat trick and added an assist to earn player of the game honors as the U.S. Select 17's routed host team Germany, 8-2, in the Five Nations Tournament. The win gave the U.S squad the silver medal and came a day after it had been shut out by the Czech Republic. Team USA broke open the game in a three-and-a-half minute span in the middle period when two of Crone’s goals bookended his one helper. The 5-8 right-shot playmaker, who skated for the Dallas Stars Elite U-16's last season, signed a tender with USHL Omaha for the 2014-15 season. 2016 recruit Clayton Keller talked with the Belleville News-Democrat about expectations for his two years with the NTDP program before beginning his Terrier career. Keller spent last season with the Shattuck St. Mary’s prep team, which he led in scoring (36-41-77 in 51 games) despite being the youngest player on the roster. Keller and current BU freshmen Chase Phelps (66 points) helped lead the Sabres to the 2014 Tier I U-18 national championship. Former BU MVP Alex Chiasson is the latest member of the Terrier hockey family to accept the Ice Bucket Challenge to raise funds for ALS research. Chiasson, who was traded from Dallas to Ottawa during the off-season, challenged former Terrier head coach Jack Parker to follow suit, which he did. Former Terrier captain Wade Megan (photo) has signed a one-year contract to remain with the AHL San Antonio Rampage. The left-shot center from Canton, N.Y. began last season with the ECHL Cincinnati Cyclones. After playing in 16 games for the Cyclones, he was promoted to the Rampage and recorded an 11-6-17 line in 43 games . Megan then returned to the Cyclones for their post-season, tallying 10 goals and three assists to help them reach the Kelly Cup finals. Former BU forward Ryan Weston has signed on with the San Diego Jr. Gulls as assistant coach of the 16AAA squad. Three Terriers have been named to the National U-22 squads of their respective nations: Junior Sarah Lefort—last season’s Hockey East Player of the Year and a second team All-American—and freshman Victoria Bach earned spots on Hockey Canada, while sophomore Maddie Elia was rostered by Team USA. Last season’s captain, Louise Warren (photo), was selected by the Calgary Inferno in the third round of the Canadian Women’s Hockey League draft. The Boston Blades made ex-Terriers Kaleigh Fratkin and Taylor Holze their fifth and 14th round picks. After a strong showing at USA Hockey’s National Junior Team evaluation camp, freshman Jack Eichel, expected to be one of the top first-year players in the NCAA, continues to be the subject of media inquiries. He talked about his early days on skates with Yahoo! Sports’ Sunaya Sapurji, who also spoke with Eichel’s former NTDP linemates who are now his college rivals. Playing in only two of the three international games after the squad was cut to 27, Eichel recorded a team high 8 points (1G, 7A). Kieffer Bellows scored twice and Hank Crone assisted on a pair of scores as the U.S. U-17 Select team defeated Switzerland, 5-3, to remain unbeaten in the U-17 Five Nations Tournament in Germany. Both are 2016 Terrier recruits. Bellows opened the scoring with a first period power play goal and tallied the game-winner in the middle stanza. Crone had the primary assist on another USA man-advantage score and an even strength goal. Next up is the Czech Republic tomorrow. 2015 recruit Bobo Carpenter (photo) is heading to Ufa, Russia, later this month with the USHL Sioux City Musketeers to play in the Junior Club World Cup. 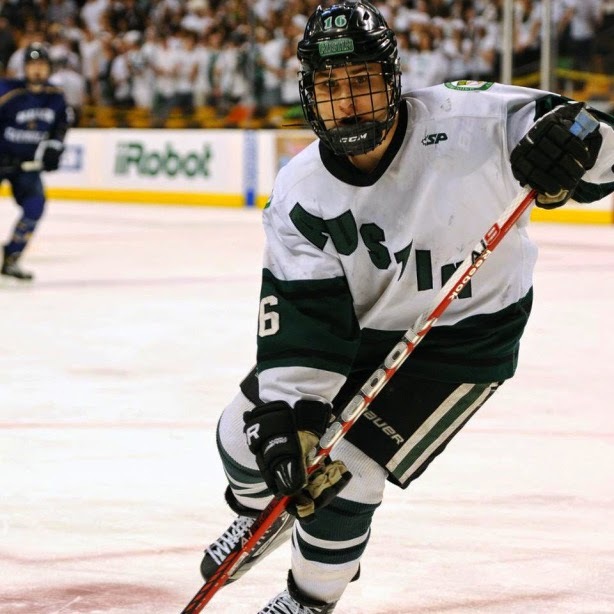 The 5-11, 175 lb., right-shot forward, who led Austin Prep to the Massachusetts Super 8 championship game last season, will spend this year with the Musketeers. Last month, Carpenter, who had a 5-4-9 line in nine games for Sioux City last season, participated in the Toronto Maple Leafs’ development camp. 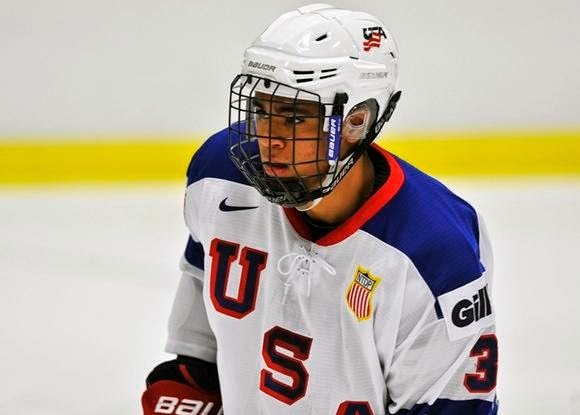 The Musketeers’ roster also includes former Terrier Sam Kurker, picked up in the Indiana dispersal draft..
2015 recruits Jordan Greenway and Charles McAvoy return to Ann Arbor for their second season in USA Hockey’s NTDP program. The U-18's schedule for 2014-15 includes three international tournaments, games against USHL opponents and 17 match-ups with college teams, highlighted by a visit to Agganis Arena on Oct. 18 to play the Terriers. Last season, Greenway, a 6-4, 212 lb., left wing scored 15 goals and 26 assists, while McAvoy, a 5-11, 190 lb., right-shot defenseman had a 7-11-18 line. The Terrier Hockey Alumni held their annual Players’ Golf Tournament this past Monday at the Granite Links Country Club in Quincy, Mass. The fundraising event benefits the BU Hockey Program and brings together former Terrier players to demonstrate support for current players, not only during their time as BU student-athletes, but afterwards, as well. The tournament drew 74 golfers and the winning foursome with a score of 63 included BU Athletics Hall of Famers Rick Meagher and Mike Eruzione, Mike’s son Vinnie and Tom Callinan. A stroke back at 64 were John McCarthy, Brian Strait, Craig Sanders and Brandon Yip, one shot better than the team of Tommy Kelley, Danny O’Regan, TJ Ryan and Brendan Ryan. John Cronin won the closest to the hole competition with 3 feet, 3 inches on a par three, while Coach David Quinn earned longest drive honors. Meagher and Eruzione, who led BU to four ECAC championships and four NCAA Final Fours (1974-77), finished their college careers as the Terriers' first and second career scoring leaders respectively. ►Former Terrier forward Eddie Wright will be inducted into the Chatham, Ontario, Hall of Fame next month. For a CKSN Sports column, Wright talked about his career, starting on local rinks with close friend Herb Wakabayashi, followed by his career at BU skating on the “UN Line” with two-time All-American Wakabayashi and Serge Boily and then a 40-plus year stint coaching and teaching at SUNY Buffalo. Note that the author is Wakabayashi’s nephew, Dwight, a columnist for Bleacher Report. ►Sports Illustrated, celebrating its 60th anniversary, asked fans to vote for its most iconic cover from among 32 choices. 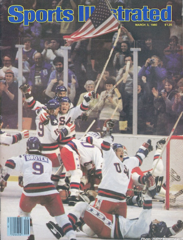 The March 3, 1980 “Miracle on Ice” cover won in a landslide. Celebrating the gold-medal winning U.S. squad at the Lake Placid Olympics, it “remains the only SI cover without any headlines or type whatsoever.” Photographer Heinz Kluetmeier explained: "It didn't need it. Everyone in America knew what happened." Four Terriers played key roles in what is widely recognized as the greatest sports event of the 20th century: forward David Silk, defenseman Jack O’Callahan (exulting while sitting on a teammate in the iconic cover photo), goalie Jim Craig and captain Mike Eruzione, who authored the winning goal against the Soviet Union in the semifinals.